John Martin, ‘The Destruction of Pompeii and Herculaneum’ (c. 1821). Against this background, the attraction which the AD79 eruption of Vesuvius held for the English painter John Martin (1789-1854) needs little further explanation. 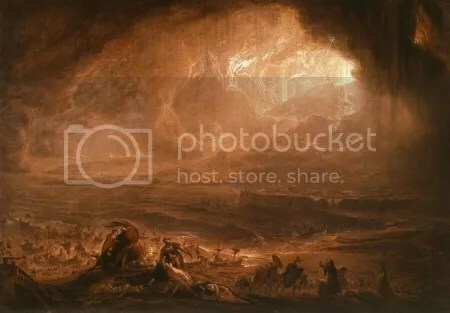 Martin specialized in huge canvases depicting vast panoramas of cataclysmic, often Biblical, events: The Seventh Plague of Egypt (1823), The Eve of the Deluge (1840), The Great Day of His Wrath (1851-3), The Destruction of Sodom and Gomorrah (1852), The Last Judgement (1853). Around 1821 Martin painted ‘The Destruction of Pompeii and Herculaneum’, which is reproduced above (the original is in the Whitworth Art Gallery, Manchester). The picture shows the town of Herculaneum on the right, fronting the Bay of Naples, the turbulent waters of which seem to rush in from the left – but topographical accuracy is not Martin’s concern, any more than is the accurate depiction of volcanic phenomena. 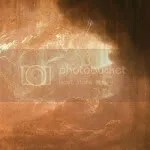 Instead he shows a sweeping vista of all-encompassing catastrophe, in which the cowering figures in the foreground are dwarfed by the huge destructive forces of nature that surround and envelop them. The entire landscape is swept by fire and brimstone, thick smoke and choking ash. Soldiers find their glittering armour and splendid shields useless against the eruption; wealthy citizens who have attempted to rescue their riches fall back, dead or dying, upon their piles of now worthless treasures; in the bay below splendid merchantmen are shattered and overwhelmed by the rushing waves unleashed by the eruption, while across the bay the once rich and splendid town of Herculaneum is buried by ash amid the volcano’s baleful glare. There is no one focus to the picture – an ambiguity which emphasizes the universalism of this cataclysm. A local volcanic eruption is transformed by Martin’s vision into an image of the end of the world, a last judgement upon the vanity, hubris and decadence of man.